But these times request for new heroes, new Jobsian heroism, fighting against the status quo. And fortunately we have a few nowadays. One of the most well-known of course is founder of Facebook, Mark Zuckenberg. As an ‘Enfant Terrible’ he is moving through the landscape of digital media. Never afraid to express his opinion about Microsoft, Google; location-based services, the future of his platform and of course privacy. Neither he is shy. I a recent interview he acclaimed that Facebook will reach the 1 billion members. “It’s not a matter of if, but when”, he said. What if your favorite player lights up the skyline of Johannesburg? With your headline? You can just do it with Nike. As part of the ‘Nike future’ campaign, you can let the whole world know which player will write the future in the World Cup. Go through Facebook or use Twitter with #NikeFuture and your headline may be displayed on this huge LED screen on one of the tallest buildings of the city. I just did. Crazy. That’s what I can say. How on earth is it possible that one company can make people stand in line for more that 32 hours, for a piece of glass and sillicon? To camp on the streets of London like a homeless person, to fight for the right to enter first, to be one of the few to lay their hands, no, to own a .. phone? Yep, they did it again. Apple today infused the European continent with their next iteration of the iPhone, creatively named the iPhone 4. That the iPhone was a huge hit may not come to a surprise to many of our readers, but that they could pull it off again is remarkable, to say the least. It clearly shows the effect of state-of-the-art technology in combination with superb marketing. We were in London to participate in a congress on mobile technologies which was organized *coincidentally* the day after the launch of iPhone 4. We couldn’t resist, being in London the day this device was launched, so we took the sub to Regent Street. Silently hoping two iPhones would be left, waiting to be picked up by two Dutchies. Our dreams were shattered when entering the proximity of the Apple Store. Crush-barriers were keeping the queu in line, special Stewards were facilitating the immense flow of people, the loooong line, waiting to get in. The first person in line waited for 32 hours, flew over from Dubai and when the doors opened was being held back to let people who preordered the iPhone came in first (whom *only* waited for 16 hours). The guy is pretty pissed-off (although he did get his iPhone) and promised to write to Steve personally. Obviously we had no time to wait that long, so we had to do it with some tangible hands-on experience with this marvelous piece of technology. And boy, this screen is *crisp*. There is no way you can see that the letters on the display are actually on a display. It really looks like they are printed on the screen. The phone feels solid -may be a bit heavy- and the design is awesome. It does make the 3GS look sooo 2009. The front facing camera will open new possibilities and though we couldn’t test FaceTime ourselves I’m sure we will have a lot of fun with it. We could only ‘testdrive’ it for about 3 minutes. People waiting in line behind us were getting inpatient to touch it themselves. Socially as we are, we let them. In our New Media Masterclass we explain the difference between a Digital Native and a Digital Immigrant. The latter is a person who still remembers that queeking sound of a 56K modem, or for that matter, really had a life without a mobile phone. Digital Natives, usually younger than 30 years, grew up with the internet. For them, internet is the same as color television was for me back when I was a kid (“No seriously mom, did TV ever only had black and white?”). There’s can be a major difference between Immigrants in Natives as far as adoption of new technologies is concerned. I say ‘can be’, because not all Digital Immigrants are Digital Losers. I know a lot of smart senior citizens who are very, very clever using modern technologies. Then again, I also know a lot of young people who don’t give a sh*t about the internet and all that it has to offer. And that’s of course OK. Ket’s be honest, you do need an analogue life as well in order to function properly in society. But what about people who are born now, or like in the case of my daughter, two years ago. Het life expectancy is no doubt about 100 years and before she can remember she has been playing with the iPad as if it is her first Fisher Price. With what kind of technologies will she grew up, knowing that for many people the ‘Star Trek age’ had finally arrived? Don’t get me wrong, I love my job and all the assignments it brings along. Each project is a challenge and -apart from paying the bills- it’s foremost an expression of my creativity. Whether it be a video, and e-learning project or a workshop social media. But some assignments are a bit more special. Like this one. Making a promotional video for a small resort on the Dutch Caribbean island Bonaire. Who cares that the temperature rose well above 32 C (90 F). Full disclosure: the resort is owned by my family in law. ‘What ever you do, they’ll talk about you anyway’, is a free translation of a Dutch saying. Still, you’d better know what is being said online about you and your products, services and brands. ‘It doesn’t hurt if I don’t know’ is another translated Dutch saying (anyone knows the English equivalents?). But harm can be done in the blink of an eye. So listening is important, but it doesn’t stop there. Take Motrin, a painkiller in the USA, two years ago. Immediately after the publication of an ad on the Motrin website on a Saturday (it’s not available anymore, but here’s a description), people responded emotionally through Twitter, Facebook and YouTube. The majority of them were moms. Before the weekend was over it skyrocketed in the media. The ad agency nor Motrin were aware of the impact of the Social Media turmoil, but damage was already done. BP’s current attitude towards the environmental catastrophe, which takes place in the Gulf of Mexico, is another example how it should not be handled. BP is mainly silent, doesn’t give a lot of information, and if it does, it’s manipulated. No surprise people have no confidence in how the crisis is handled and they simply don’t trust the company. Why did it take BP 5 weeks before it acknowledged that this is a major environmental catastrophe, where the rest of the world understood this shorty after the oil platform exploded and disappeared in the ocean? Illustrative is the invitation I received the other day from my brother in law to join the Facebook group ‘Boycot BP‘, currently with more that 277,000 fans, amongst them Bill Cosby. Not good for your brand. Knowing what is being said online is important. Responding is the next. But understand how to respond. Not like Nestlé did recently to Greenpeace, which started an anti-Nestlé campaign referring to the use of palmoil for the production of Kitkat. Palmoil, bought by Nestlé from companies destroying the Indonesian rainforest in order to plant palm trees. Greenpeace made a video and published it on YouTube, which Nestlé enforced to take away from the platform, due to copyright infringement. Fuel for Greenpeace’s campaign unleashing their entire community to spread the word about Nestlé. What if Nestlé had responded less aggressive on this video, or even had ignored it? Southwest Airlines is doing a better job, although still not perfect. Recently, Southwest refused to take an obese passenger onboard on a domestic flight in the USA. The man, Kevin Smith, a Hollywood director, responded with fury via his Twitter account and in no time the story spread all over the States and was picked up by the media. Southwest Airlines responded rapidly through their own blog (here and here), although not always with the right attitude, resulting in negative publicity. (click here for an earlier article on our blog on this subject). So, again, listening is important but responding in the right way even more. Responding in such manner that your audience in it’s turn listens to you. 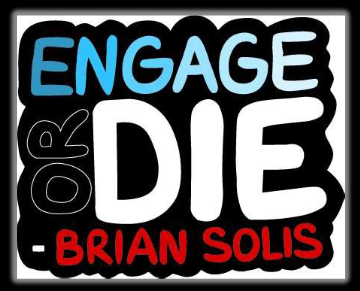 ‘Be engaging’, says Brian Solis, a social media expert, whom I recently interviewed at SXSW 2010 in Austin, Texas. ‘In order to be engaging, you need to be believable. And you can only be believable if you’re empathetic towards your audience. Recently, Brian Solis gave an interesting webinar on this subject, organized by Strongmail. And it’s available online. It takes an hour, the audio-quality is moderate, but hey, wasn’t Content King. Enjoy, it’s more than worth it. And if you still want more? Try his book, Engage.